Srinu who is an agricultural worker from Burugupalem in Makavaram mandal, Naidu is survived by his wife Sanyasamma and two children Butchaiah Naidu and Varalakshmi. The daughter of Srinu alleged that her father had died the day he was admitted to the hospital. She accused the doctors of not confirming his death under police pressure. 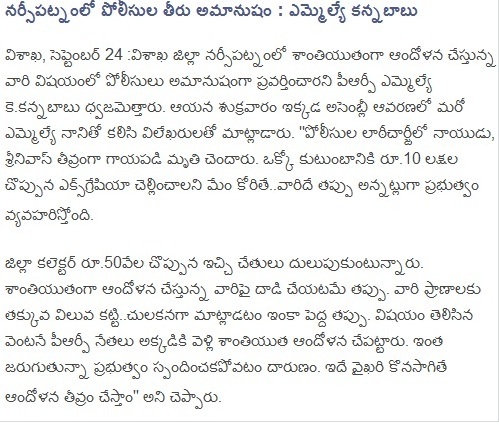 Patrudu also supported her allegation. He demanded `10 lakh compensation and employment to one of the family members of Naidu. He also demanded that the government take action against revenue and police officials responsible for the death of Naidu. 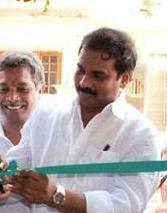 But Superintendent of Care Hospital Ramaraju said the condition of Srinu was still critical. District SP Vineet Brijlal, meanwhile, claimed that both Srinu and Naidu had jumped from the police vehicle and dismissed reports that both had sustained serious injuries in police lathicharge. He further said the police had forcibly shifted Patrudu to a hospital on the advice of revenue and medical officials.